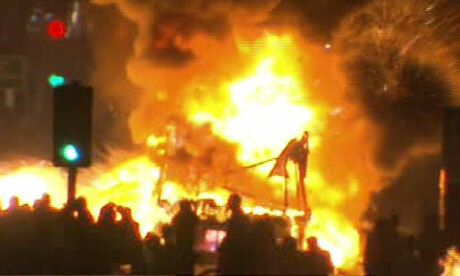 Milan on Tuesday. Photo: Guardian. Well, Arsenal officially crashed out of Europe on Tuesday, though they went out in a God damned blaze of glory, didn't they? Ultimately, the Gunners didn't have a fourth goal in them, but what a wild ride that first half was. It made me immensely proud to be a Gooner. Well done, boys. The distractions are gone now. It's just the league to play. Arsenal has sole possession of fourth after Chelsea's loss last week. 11 games to go. In terms of prognostications, it looks like Arsenal still needs about eight wins from them to clinch top four; though, that's really an average. If they beat Chelsea on April 21, it's more like seven wins (since a Chelsea loss affects the gap between the two equally to an Arsenal win.) If they lose to Chelsea, then they could have to win eight or nine of the remaining 10. Last week, Arsenal did a fantastic job of putting some breathing room between themselves and Liverpool. 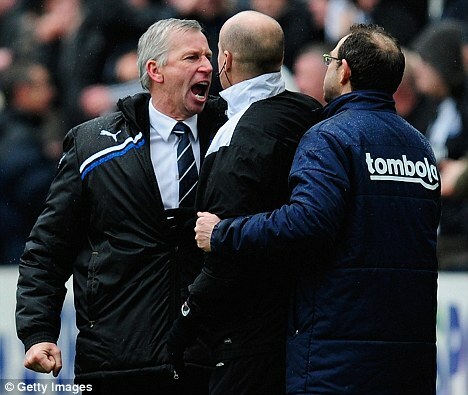 This week, it's time to do that to Newcastle. Three points at a time, Arsenal! Slow and steady wins the race! Other random cliché! forget again. Photo: Daily Mail. On the defensive line, all of the news comes from the left side. Kieran Gibbs is a slight doubt with a minor recurrence of a groin injury. He's probably a little more than 50/50. Meanwhile, Andre Santos has been training lightly for about six weeks now and is, apparently, available for selection. Santos will only play if Gibbs doesn't pass fit, since the Brazilian hasn't played in three months and I think that's still up in the air. 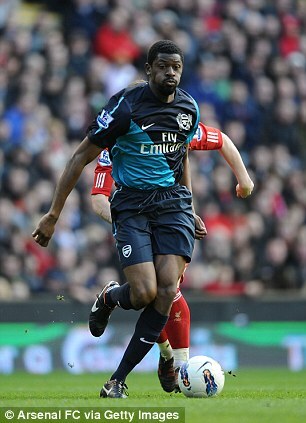 In the midfield, we all know by know that Abou Diaby has had another setback and will miss a few more weeks. Francis Coquelin's hamstring injury will apparently keep him out another three weeks. Yossi Benayoun could be short for Monday, as he just returned to training yesterday, but he's likely to be named on the bench. There's a lot of good news in the midfield, though, as Mikel Arteta (concussion) and Aaron Ramsey (ankle) should both be available for selection. Up from, Theo Walcott took a kick to the hip against Milan but is likely to return, while Alex Oxlade-Chamberlain was suffering from illness, but he's available, too. Predicted XI: Szczesny, Sagna, Koscielny, Vermaelen, Gibbs, Song, Rosicky, Arteta, Walcott, Oxlade-Chamberlain, van Persie. You know what? Newcastle United has too many nicknames. The team itself is nicknamed the Magpies because of the black and white color scheme. 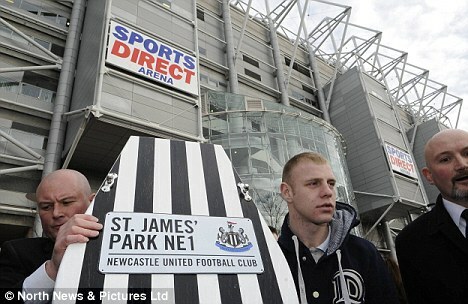 But they're also the Toon, which comes from the Geordies' local pronunciation of the word town. And speaking of Geordies, that's another nickname. But you know what I see when I look at their crest? Seahorses. What the hell is that? I'm calling them the Seahorses from now on. The big injury news this week from the Seahorses is that Denmark international Peter Lovenkrands has suffered serious damage to his thigh and is likely to miss the rest of the season. With his contract due to expire, it's likely he has played his final game in black and white. That's their only new injury, as he joins the list of long-term injuries for the Toon. Leon Best and Sammy Ameobi are both out with knee injuries. Best could be back late this month or next, but Ameobi's season is likely over. Steven Taylor is out for the year with a ruptured Achilles. Sylvain Marveaux is out until the beginning of next month with a groin injury. Not mentioned in the above list is Nile Ranger, who has been missing with an ankle injury. Ranger has not played for Newcastle this season, and had his loan time at Barnsley cut short through injury. He was also recently fined for homophobic tweets, then had to appear in court to deny an assault charge. So, not a good season so far for him. He'll face trial in June. in the face. Honestly, I don't blame him. Photo: Daily Mail. Ignoring that one terrible week where Arsenal lost 4-0 at Milan and 2-0 at Sunderland, the Gunners are on a brilliant run of form. They have won four straight in the league for the second time this season. They've also won four straight at home. Both of those streaks go back to January 22, when Arsenal lost 2-1 to Manchester United. This is Arsenal's longest winning streak at home since September through early November and their longest league winning streak since October through later in November. Newcastle are coming off a hard fought Tyne & Wear derby with Sunderland that saw both squads charged with failing to control their players. The Seahorses got a late goal against ten man Sunderland from Shola Ameobi to secure a 1-1 draw after Nicklas Bendtner had put Sunderland up from the penalty spot and Demba Ba had a penalty saved in the 82nd. Newcastle are currently five points back of Arsenal and sit sixth in the table. Prior to the derby draw, the Seahorses drew Wolves at home 2-2, after blowing a 2-0 lead. Before that, they were demolished 5-0 by Tottenham at White Hart Lane, a match that was uncompetitive from the start. Newcastle have not won an away match in the league since Boxing Day, when they beat Bolton at the Reebok 2-0. Dear Joey Barton, I hate you. Sincerely, Gervinho. Since regaining promotion to the Premier League for last season, the Seahorses have not lost a match to Arsenal in three tries in the league. Newcastle took a 1-0 win from the Emirates last season as Andy Carroll headed in the only goal just before halftime, thanks to Arsenal's inability to defend set pieces. At St. James' Park last February, Arsenal took a 4-0 lead and then disastrous things happened. 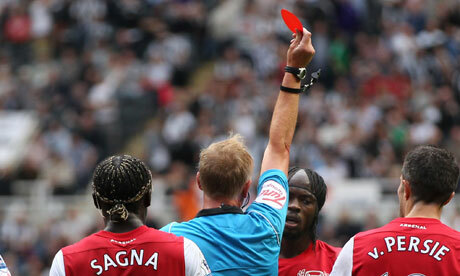 Earlier this year, Arsenal and Newcastle played out a 0-0 draw to open the season, which saw Gervinho sent off thanks to Joey Barton. Then Alex Song was retroactively given a three match ban thanks to Joey Barton. Hey, at least he's not at Newcastle anymore. Arsenal did beat the Seahorses 4-0 in the Carling Cup last season in their first meeting after Newcastle's promotion. That win predated the aforementioned three results for Newcastle and was the end of a streak where Arsenal had won five straight against the Seahorses across all competitions. home results with Webb in charge. This is what eight wins and four draws look like. The referee is South Yorkshire-based Howard Webb, so thank God it's not being played at Old Trafford for some reason. 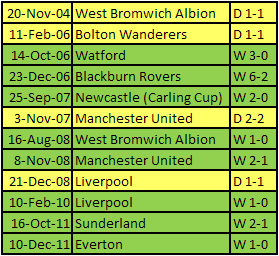 I've mentioned Arsenal's positive record with Howard Webb in matches that aren't United away plenty of times before, but their unbeaten run of ten games in such matches was snapped by Sunderland in the FA Cup. So, let's take a look at how Arsenal fares with him just at the Emirates instead. Arsenal have won both matches he worked in North London this year, over Sunderland and Everton. Last year, Webb only worked two Arsenal games and both were on the road. In 2009/10, Webb's one match at the Emirates was a 1-0 win over Liverpool (he ignored a legitimate Liverpool shout for a penalty at the death in that one, when Cesc Fabregas, standing in the wall, cheekily handled a free kick.) The year before that, he worked a 1-0 win over West Brom, a 2-1 win over United, and a 1-1 draw with Liverpool in which he sent off Emmanuel Adebayor. In 2007/08, he worked two at the Emirates: a 2-0 win over Newcastle and a 2-2 draw with United. In 2006/07, two more: a 3-0 win over Watford and a 6-2 win over Blackburn. Before that point, Arsenal played at Highbury. Ten matches at the Emirates with Webb in the middle, Eight Arsenal wins and two draws. The streak extends two more draws at Highbury, but ultimately, Arsenal have never lost a home game with Howard Webb as the referee. This year, with Howard Webb in the middle, Arsenal lost at Old Trafford by a certain disastrous scoreline that shall go nameless, a 2-1 win over Sunderland at the Emirates, a 1-0 win over Everton at the Emirates, and the FA Cup loss three weeks ago. until January, because this happened in August. Playing on Monday has its advantages sometimes; as the last match of this round of fixtures, Arsenal will already know how the closest teams around them in the table (Spurs and Chelsea) have fared in this weekend's matches by the time they play. Six matches start the weekend on Saturday. Sky Sports has gone with a relegation six-pointer to kick things off, as Bolton Wanderers host QPR at the Reebok. Bolton won the reverse fixture 4-0 at Loftus Road. Four matches take place in the standard 10 a.m. Eastern time slot. It's a battle of mid-table bookends as 15th place Aston Villa host 8th place Fulham at Villa Park, Chelsea hosts Stoke at the Bridge (Stoke held the Blues to a draw at the Britannia in the reverse,) Liverpool travels to the Stadium of Light for a tricky road fixture at Sunderland, and in another relegation six-pointer, Wolves host Blackburn at Molineux. They're both level on points, but Blackburn are ahead, and thus out of the drop zone, by four on goal difference right now. Saturday's late game is a tricky road fixture for Tottenham Hotspur as they face Everton at Goodison Park. The Manchester sides continue their battle for first place on Sunday (necessitated by their Europa League commitments.) Both of those matches kick-off at 10:00 a.m. on the East Coast (note the time change, those would have been at 9:00 last week.) United will be at Old Trafford hosting West Bromwich Albion and City will be in Wales facing Swansea. That's another tricky road fixture for a top team this week. City currently hold a two point lead for top spot over United. Sunday's late game, at noon, will see Sky Sports air Norwich hosting Wigan at Carrow Road. Why they picked that one, I have no idea. These are the reverse fixtures of those played on the weekend of August 13-14, which was the first weekend of the season.